Reward basis, what it's worth to you to have me find your lost jewelry, plus call out fuel charge, $25 to $35 depends on distance traveled. Parks, Beach, Schools, Yards, Lakes and Rivers up to 5' deep. I have been metal detecting for about 10 years now and have found some really cool and nice things that I wished I could of returned the to their owners. I have experience detecting in parks, lakes and even detected in the ocean in Mexico. The sooner you contact me the better the chance of recovering your recently lost items. I look forward to being able to help recover your lost valuables. 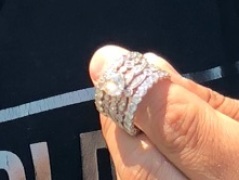 I lost my wedding ring in the Russian River on Friday, August 10, 2018. I found Demian on Sunday, and he made everything possible to meet us at the Russian River on Tuesday, August 14, 2018. Not only was he professional, he knew exactly what questions to ask in order to locate my ring. After we pointed out the exact location, Demian took literally less than 3 minutes to find my wedding ring. I would have never thought searching the internet would lead us to Demian, and we are so grateful to have found him. This is a great story that will be told for years to come, and thanks to Demian, we were lucky enough to find it. He is a good guy, with a great heart, and truly cares about helping people find their most prized possessions. We can’t be more grateful for Demian, and would highly recommend him over and over again. Thanks so much Demian, for making me whole again!